Practicing since 2002, Dr. Kwartowitz has extensive general orthopedic and sports medicine experience, including upper and lower extremities. He also specializes in minimally invasive knee, hip, and shoulder surgery. Using the latest technology and minimally invasive surgical procedures, Dr. Kwartowitz helps patients return to the activities they enjoy with minimal downtime and pain. He and Dr. Lederman are the first orthopedic surgeons in a major metropolitan area in the country to use MLS laser therapy. 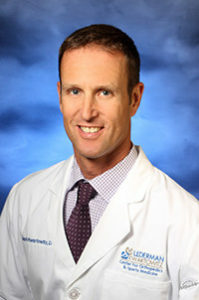 Dr. Kwartowitz is an avid runner and Ironman triathlete, most recently finishing the Louisville Ironman in October of 2018 in the top 20% of his age group. Through his personal experience in sports, he knows the importance of effectively addressing athletic-related injury and returning patients to their optimal condition.